We live in a suburban area and our children are big fans of nature. Although we can’t “camp out” in the traditional manner in our neighborhood, our kids wanted to come up with a way to do so. 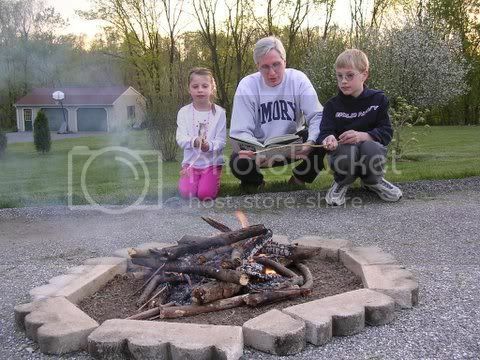 On their own they prepared a campfire on our driveway (using dirt and pavers to protect the driveway). 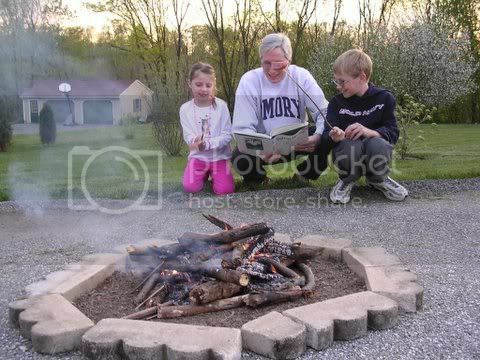 We all gathered around the “campfire”, roasted marshmallows and salami, read poetry, and had a wonderful story time. Dad read (see attached pictures) while Mom, Grandpa, and the children ( 7 and 11) enjoyed the poems from Shel Silverstein’s Runny Babbit. After that, our daughter sang songs and danced for us. A great time was had by all and we thought we would share it with you. Enjoy.